Hi from Brevard NC, land of waterfalls and pickleball. My partner and I found Brevard, and our new community, Connestee Falls back in Y2K. Bring back memories? Back then, I was an air traffic controller at the center in the Washington, DC area. Retired now, that was my 3rd, but primary career, having enjoyed a few years as a lab tech and computer programmer, and before that, a science and PE teacher/coach. I've been in every state of the union, and have traveled through Africa, Australia, New Zealand, Canada, Mexico, South America and Europe....Did I mention I like to travel and now I don't leave home without my paddle. My pickleball introduction was in October of 2010. Our wellness committee offered an afternoon seminar in Pickleball and I HAD to see what this sport with the dumb name was all about. We used two tennis courts with some taped modified lines, paddles and balls, some enthusiastic teachers and 40 rookies. At the end of the seminar someone came up to me and said "You're pretty good at this...want to organize it? I said yes and we haven't looked back. We played for about 8 months with tape or chalked lines but our numbers grew. Today, we have an active and enthusiastic group of about 175 pickleball players who meet regularly for fun and competition. 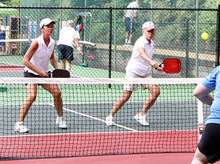 Our community has expanded and renovated one tennis court into 4 state of the art pickleball courts. We have hosted 2 tournaments, collectively raising $7000 for our local high school and college students as scholarships. We have offered beginner classes for 2 years and this year, added sessions of intermediate and advanced skills training. We have started a ladder with the help of USAPA and play weekly, and have an interclub event weekly with another local group of players. We are also a very social group, hosting a monthly gathering during the summer called "Pickles and Beer". We are listed with USAPA and we invite and encourage visitors to enjoy our hospitality and community in the beautiful mountains of Western North Carolina and Upstate South Carolina. Check out our website, www.carolinapickleball.com See you on the courts!